azin's review (This content has been automatically translated from French)" An excellent product which we speak too soon." I auditioned for this unit for 1 month. I owned a Zoom H2, a Fostex FR2 On a Yamaha C24, I have a Sony PCM M10, an Olympus LS-3. One of the few recorders size "pocket" and quality. 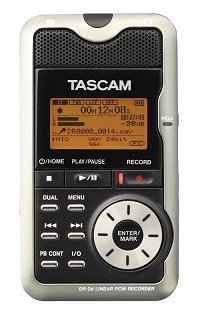 The new firmware Tascam DR-2d gives more autonomy, the average user gives 5h with ordinary alkaline and works well with Ni Mh. To change the firmware must be at some point push 3 buttons at the same time, I took me a while to understand it. 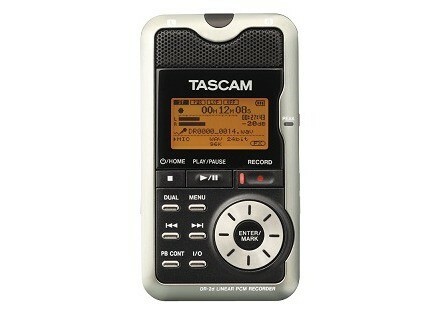 On other sites you compare this to the best recorders like the Sony D50. My tests confirm the good sound quality compared to Sony Pcm M10 and Olympus LS-3. Detailed sound image and transparency, there is very little exceeds the HD600 headphones the Olympus LS-3, LS-5, LS-10 in accuracy, one could almost confuse the results, a little more transparency to the DR-2D but a breath (S / N) higher in very quiet environment usually imperceptible. The stereo is good. Monitoring, listening with headphones directly from the DR-2D is not perfect I would give 8 out of 10. Against 10/10 for leM10 and 5/10 for the LS-3. Appreciated for the ability to simultaneously record two sound sources, such as a file content in memory and a line or microphone input. I have not managed to record an external microphone with internal microphones +. Mode with "dual" one can record in doubles with an offset of-12dB, a practice not to be surprised and be confident in the result. In the menu options: - Record in mono. Pre REc, Delay, metronome. The amp is a little weak, we are already saving on HIGHT volume 10/10 with Dr. el-2d and only slow the M10 Mid and with the LS-3. The value for money is good it is found now at the end of production to 200 €. Qualities, sound quality, dual recording, light and pocket. Defects: Like most recorders Auto mode is not annoying parfait.Souffle Registration as a distant owl all night and calm moods. Sensitive to the wind as with all directional microphones. Amp is underpowered. la.boulanderie's review (This content has been automatically translated from French)" I'm amazed"
This is my first portable recorder so I have no points of reference with other brands or models. - The different resolutions (24bit max / 96 Hz). I bought it mainly to record ideas for songs when I play the guitar outside my home studio (eg when on holidays). I thought that with the integrated mics the quality will be average, the stereo necessarily very limited. So I tried the same day as just two simple batteries to activate the machine. I went to Park Monceau. I sat on a bench. I turned on the machine which took me not more than 5 seconds and I captured the overall soundscape. I got up and walked while I let the recording continue and I walked out of the park to the nearest avenue. That evening back at home, I transfered the files to the computer (15 seconds) and listened to the result. I remained completely blown away. The sound recording is amazingly good. The atmosphere of the park is perfectly captured. We can hear distinctly, people walk, talk, coming from my left to go to my right, children screaming in the distance, birds in the tree above. Then we hear the sound of my footsteps, then the traffic noise closer gradually as I go into the avenue. Finally, the mood of the movement is made perfectly well. I held the recorder in hand but there is no handling noise. I then tested it to record guitar. I put the DR2D on a table at 40 cm from the guitar and I played it without other precautions invested. The result is also very very good. Almost the same quality with my static tube. The recording level is a little weak but I was not at the maximum. The sound lacks a bit proximity but some work can be further improved. I mixed this improv guitar with the noise of the park and here is a song that has a certain allure and that sounds really good. The next day, I recorded my son who played the cello in the streets for the music festival. I started 2m distance from the instrument by holding the device in hand with the crowd behind me. Again the result is impeccable with a striking spatialization effect. I can burn this file and produce my son's first live CD. There are many other editing functions, but that is hard on my eyes to edit on a little gadget, I'd rather do it on the main computer is easier. In conclusion, I think for a few months I will add in my compositions, full of sound effects as external playback quality of the stereo image is moving. I'll finally produce a piece that I have been dreaming of for 25 years. It was inspired by urban noise that I could succeed in capturing the correct way through DR2D. I will not tell you what is that extraordinary noise. I do not want to put down the idea !!!!!! neroTest's review (This content has been automatically translated from French)" test"
la.boulanderie's review (This content has been automatically translated from French)" I love it"